In the wake of President Obama’s liberal Progressive second Inaugural speech, it is time for another look at greater underlying agendas and perhaps a time to remember that Progressivism = Socialism = Fascism = Marxism = Communism. Ask almost anyone and you’ll hear, “Communism is dead! The Berlin wall came down, the USSR is gone, China is our trading partner, the cold war is over…” That is one of the problems with America and the western world; we live in the now and our attention span and planning is short term unlike those in movements promoting Communism, Marxism, Socialism, Fascism, Progressivism (all the same), a New World or Globalist Order or beliefs like Islam. Below is a list of 45 goals that found their way down the halls of our great Capitol back in 1963. As you read this, 50 years later, you should be shocked by the events that have played themselves out. I first ran across this list 3 years ago, but was unable to attain a copy and it has bothered me ever since. Recently, Jeff Rense posted it on his site and I would like to thank him for doing so. [From "The Naked Communist," by Cleon Skousen] 1. U.S. acceptance of coexistence as the only alternative to atomic war. Note by Webmaster: The Congressional Record back this far has not been digitized and posted on the Internet. It will probably be available at your nearest library that is a federal repository. Call them and ask them. Your college library is probably a repository. This is an excellent source of government records. Another source are your Congress Critters. They should be more than happy to help you in this matter. You will find the Ten Planks of the Communist Manifesto interesting at this point. …Webmaster Forest Glen Durland found the document in the library. Over the years, I have shared in debates and discussions regarding the current state of affairs in the U.S., and the changing social climate of this great nation. Since the “baby-boomer” generation, society and its culture have become noticeably different than the way it was 50 years ago. From the late 50?s to the 70?s a series of events took place contributing to the way we are currently living. However, like anything else, there has to be a starting point at which the wheels are put into motion. Sometimes it can be a single event, such as war, but more often, it is a series of events, some intentional, some planned, others unpredictable. There is always a pivotal point when things begin to change. I believe that time was 1963. By 1963 television was the leading sources of entertainment. The public enjoyed a different type of programming back then. Lessons on life could be viewed weekly on “Leave it to Beaver” or “My Three Sons.” There were hero’s back then that never drew blood, “The Lone Ranger” and “The Adventures of Superman.” Cartoon series evolved, such as, “The Flintstones” and “The Jetsons” without messages of empowering the children, using vulgarities or demeaning parental guidance. Family’s could spend a weekend evening watching “Ed Sullivan,” “Bonanza” or “Gunsmoke.” For those who enjoyed thrill and suspense, we were blessed with “Alfred Hitchcock Presents” and the “Twilight Zone.” ‘My Favorite Martian,” “Ozzie and Harriet,” “Donna Reed” and “Sea Hunt” also kept viewers entertained weekly. Movie theaters were not multiplex units with 15 screens, rather, one single, giant big screen with adequate sound and hard seats without springs. “Tom Jones” had won the Academy award for best picture. “How The West Was Won,” “Cleopatra,” “Lily of the Fields,” “The Great Escape,” “The Birds,” and “It’s a Mad, Mad, Mad, Mad World” were all box office hits. “Joys of Jell-O” recipes for quivering florescent foodstuff hit the stores. U.S. Postal rates went up to five cents for the first ounce. AT&T introduced touch-tone telephones. The Yankees played in the World Series again; but lost to the Dodgers in four straight. The government and NASA began the Apollo program. 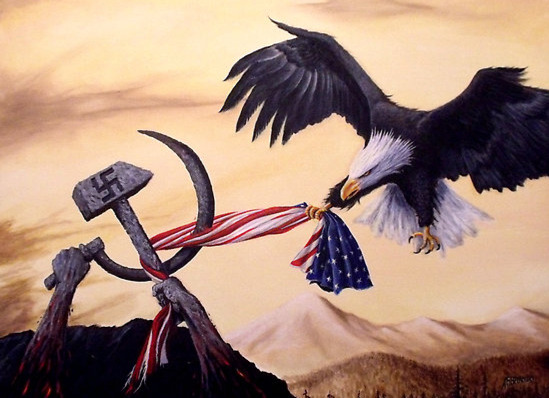 On January 10, 1963, the House of Representative and later the Senate began reviewing a document entitled “Communist Goals for Taking Over America.” It contained an agenda of 45 separate issues that, in hindsight was quite shocking back then and equally shocking today. Here, in part, are some key points listed in that document. In 1963 the news media showed women burning their bras as the women’s liberation movement took off with the publishing of “The Feminine Mystique” by Betty Friedan. Martin Luther King was jailed in April and civil unrest was being brought to the forefront. On August 28th the media brought us live coverage of the march on Washington and Dr. Kings famous “I had a dream” speech. The Cuban missile crisis found its way in to our homes and our nation was gearing up for conflict. While American’s have endured great prosperity over the past 40 years we have also lost our moral compass and direction. In reviewing the research, data supports 1963 as a focal point, demonstrating a downward slope in our moral and social decline through 2001. Purchase “the Naked Communist” here – Below is a video series that a YouTube Blogger put together about the book: The Naked Communist. Interview conducted by Edward Griffin in 1985. Manipulation of public opinion and media. Those who refused the influence of communism in their country, their reputation was ruined. Or they were executed. Physically. Revolution forces. ________________________________________________ Yuri Bezmenov: the useful idiots of socialism Presented for the first subtitled in French, this interview, although dating from 1985, is a rare news. Yuri Bezmenov, ex-KGB agent spent in the West in the 1970 recounts in detail the techniques of destabilization and manipulation of public opinion. This interview can understand why, in 2007, we still contend with a left lunar why so many teachers continue to undermine formatted generations of schoolchildren and students and why the fight against Marxist socialism, despite all the evidence its harmfulness, is always on the agenda. • knowingly implemented a comprehensive manipulation of public opinion and elites worldwide. • conditioned schoolchildren and students to Western socialist ideals on at least three generations. This task was in his 85% of the activity of the KGB. • systematically recruited all opinion leaders in the West for influence and destabilize the non-Communist world. • conditioned and “de-moralized” (loss of value) of entire sections of society, become “useful idiots” of socialism. • encouragement of the political turmoil in the world of work by politicizing the trade unions. We have thus far both feet in and we have not changed the world: we’re still the heirs of the Cold War. It is now inside the tent of disease spread. And the “useful idiots” are also still active. Obama is the master of manipulating the uninformed!! Please educate yourself and then share what you have learned with others. Thomas Jefferson was so strong on the need for public education for all so America would have an educated populace, which is needed to maintain a republic. As Benjamin Franklin said when asked by a woman. “What have you given us, Mr. Franklin?” “A Republic, Madame,” he replied, “If you can keep it!” Unfortunately, our very lacking public education system, the mainstream media (MSM) and Hollywood have all been infiltrated by Progressives… the radical left, who are indoctrinating and manipulating the public. History repeats itself and the answers for the future lie in understanding the past. The Communists, Marxists, Socialists, Fascists, Fabians, Progressives, leftists radicals… whatever you want to call them, have been busy working their plan(s) for years as we were manipulated into believing that the Cold War was over, that Communism was virtually dead except for 4 or 5 radical regimes and that we no longer had anything to fear from them. Now we have Marxism or Progressivism (Communism), Islam and our own dumbed down populace to fight… while globalist radicals have continued to forge ahead with their plans including their infiltration into our White House, Congress and Supreme Court, our education system, many of our churches and every media arm from entertainment to news that indoctrinate our children and the thoughts of most Americans… especially the uninformed!